Wally’s Answer: Using the factory reset feature will make your computer run like new again. This is because it deletes everything on the hard drive and installs Windows from a recovery drive or backup disks. This process also deletes all software and data. 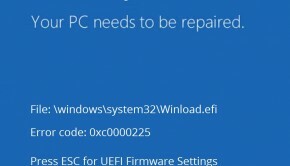 You might need to disable some extra promotional software after the factory reset process is over, which should make the computer run even faster. Windows stopped working for some reason or the computer started running really slow. We want to remind you that after this process is over, all your data will be deleted. So, make sure to copy any important files from the computer before you begin. If you can’t start Windows anymore, then you can still copy your data by starting your computer with a Bootable Linux DVD or USB. You can try downloading an ISO file of Linux Mint. You can make a bootable USB by using a software called UnetBootIn. You don’t need to install Linux Mint to use it. You don’t need to buy it either, its free. Please click this link to watch a very simple tutorial on how to make a bootable USB drive for Linux. A recovery partition is a portion on the hard disk where a backup for Windows is stored. This backup comes with every modern branded computer. It is to be used in a time of emergency, when you need to reset everything to the way it was when you bought the computer. Restart the computer > Look for a prompt on the screen and press the requested key on the keyboard > follow the instructions on the screen. This should lead you to the recovery process which is designed to set everything up.